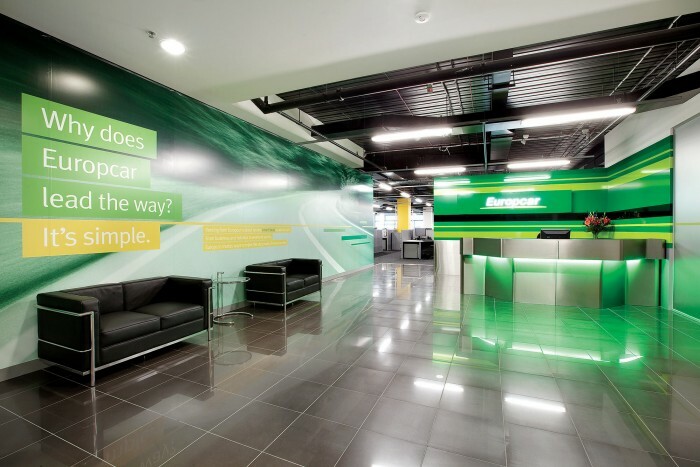 The new space for Europcar in Tullamarine was large enough to house 110 workstations in an open plan area, 30 call centre staff, 7 offices, 5 meeting rooms, a large training room, large communal café and generous utilities and comm’s room. The industrial look and feel was to match the client’s nature of the business of motor vehicle hiring, bringing out a mechanical and garage theme. The exposed ceilings and polished flooring helped this concept while the graphics added a dynamic fast energetic feeling to the space.